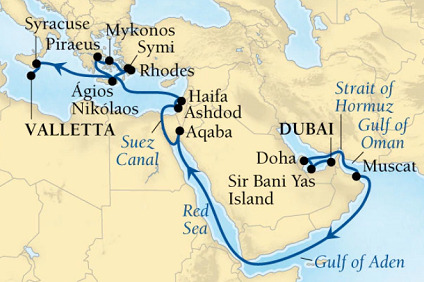 18 Night Cruise sailing from Dubai to Athens aboard Seabourn Encore. 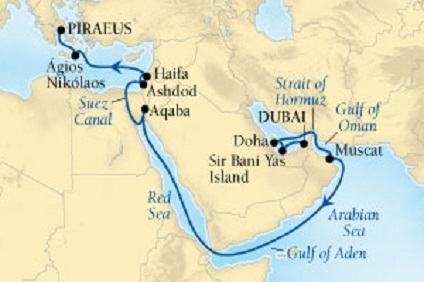 25 Night Cruise sailing from Dubai to Valletta aboard Seabourn Encore. 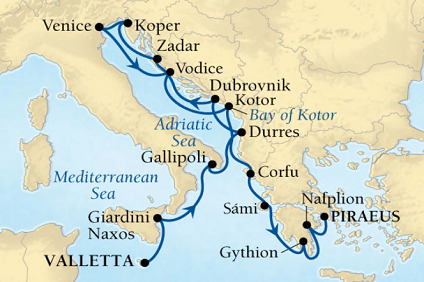 7 Night Cruise sailing from Athens to Valletta aboard Seabourn Encore. 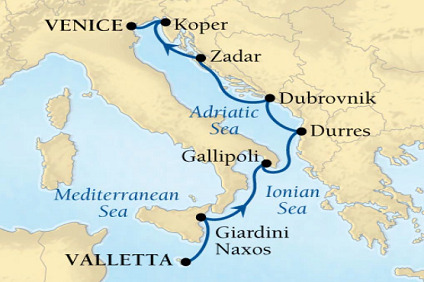 7 Night cruise departing from Valletta to Venice onboard Seabourn Encore. 14 Night cruise departing from Valletta to Athens onboard Seabourn Encore. 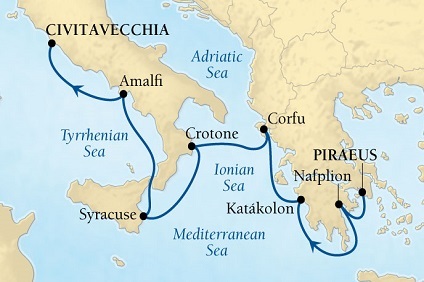 7 Night cruise departing from Venice to Athens onboard Seabourn Encore. 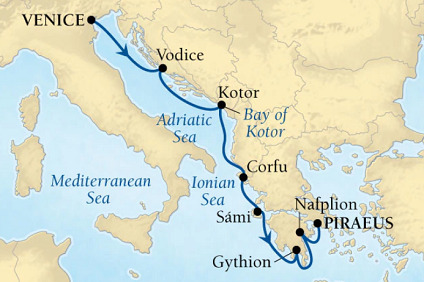 7 Night Cruise sailing from Athens to Rome aboard Seabourn Encore. 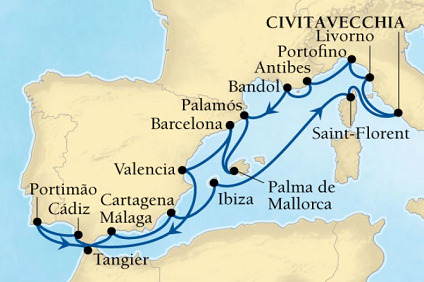 14 Night Cruise sailing from Athens to Barcelona aboard Seabourn Encore. 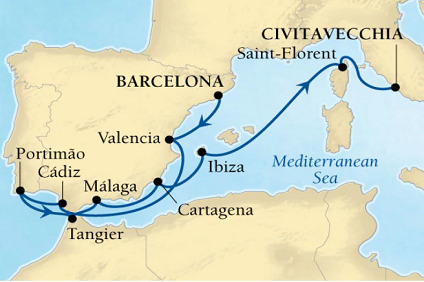 7 Night cruise sailing from Rome to Barcelona aboard Seabourn Encore. 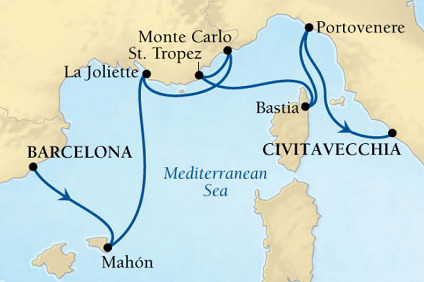 18 Night cruise sailing from Rome to Monte Carlo aboard Seabourn Encore. 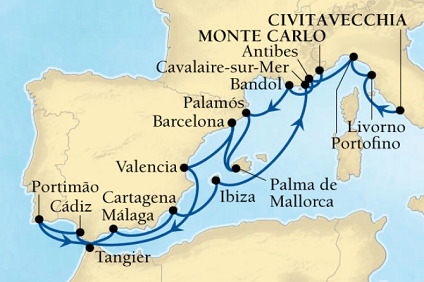 11 Night cruise sailing from Barcelona to Monte Carlo aboard Seabourn Encore. 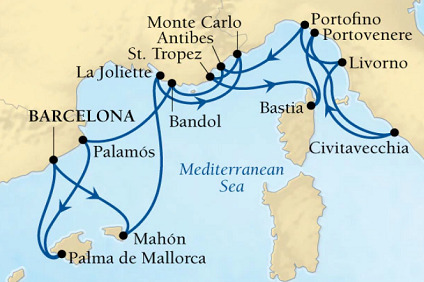 21 Night cruise sailing roundtrip from Barcelona onboard Seabourn Encore. 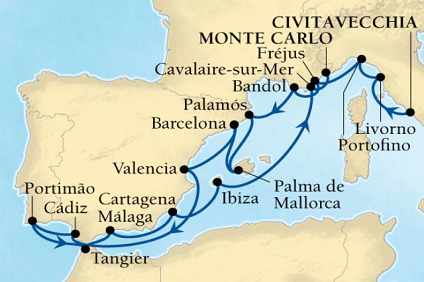 10 Night cruise sailing from Monte Carlo to Barcelona onboard Seabourn Encore. 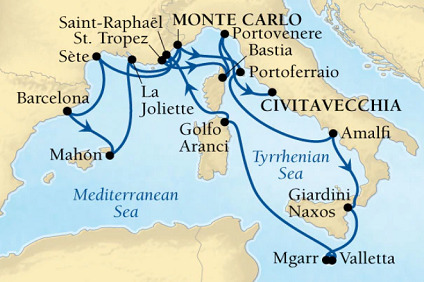 17 Night cruise sailing from Monte Carlo to Rome onboard Seabourn Encore. 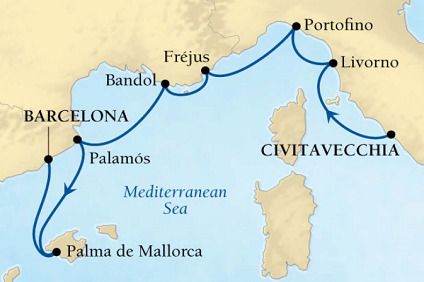 7 Night cruise sailing from Barcelona to Rome onboard Seabourn Encore. 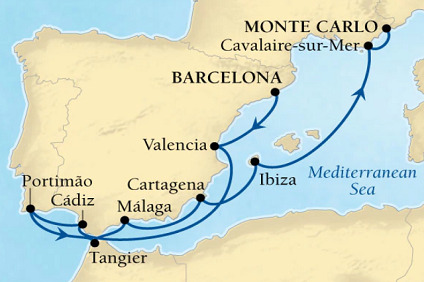 14 Night cruise sailing roundtrip from Barcelona onboard Seabourn Encore. 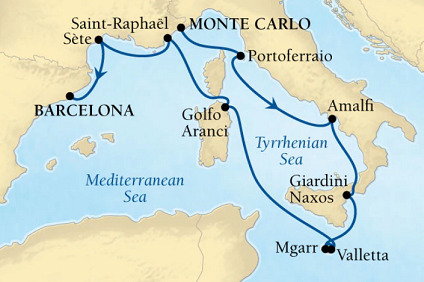 18 Night cruise sailing from Rome to Monte Carlo onboard Seabourn Encore. 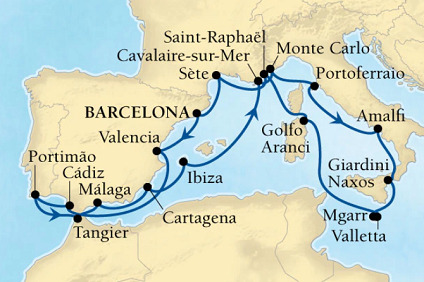 7 Night cruise sailing from Rome to Barcelona onboard Seabourn Encore. 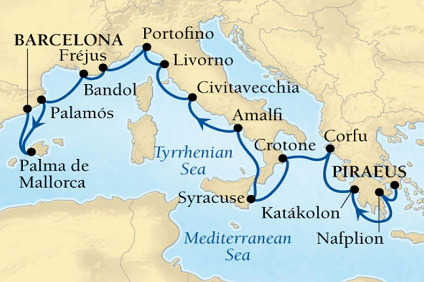 18 Night cruise sailing roundtrip from Rome onboard Seabourn Encore. 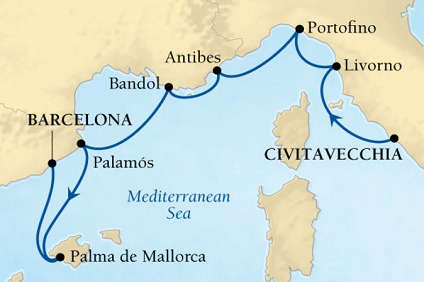 11 Night cruise sailing from Barcelona to Rome onboard Seabourn Encore. Wintergarden Suites feature large windows with ocean views, dining for six, bathroom with whirlpool bathtub, guest bath, Glass-enclosed solarium with tub and day bed, pantry with wet bar, and two flat-screen TVs. Complimentary Internet/Wi-Fi service. Approximately 989 sq. ft. (85 sq.m.) of inside space, plus one veranda of 138 sq. ft. (17 sq.m.). Includes all the in-suite amenities, plus: An invitation from the Master for a bridge visit when the ship is in port. A personal visit from the Hotel Director. Fresh orchids or potpourri in your bathroom. All-natural Molton Brown bath and beauty products including Pure Pampering bath oils. A large basket of succulent tropical fruits. High-quality bathrobes, soft and luxurious. Complimentary Internet service. A large bouquet of fresh flowers when you embark. A convenient espresso machine with a variety of coffees in your suite. Complimentary private car transfers between airport and ship. * A choice of daily newspapers delivered to your suite. ** Wellness Bag exercise kit containing easy-to-carry workout gear available upon request. ** * This amenity does not apply to upgrades. ** This applies to Odyssey, Sojourn and Quest guests only. The configuration of Accessible Suites may vary from the non-accessible Suites shown above. Signature Suites feature expansive ocean views, forward-facing windows, dining for four to six, bathroom with whirlpool bathtub, guest bath, pantry with wet bar, and two flat-screen TVs. Complimentary Internet/Wi-Fi service. Approximately 977 sq. ft. of inside space, plus one veranda of 493 sq. ft. (46 sq.m.) Includes all the in-suite amenities, plus: An invitation from the Master for a bridge visit when the ship is in port. A personal visit from the Hotel Director. Fresh orchids or potpourri in your bathroom. All-natural Molton Brown bath and beauty products including Pure Pampering bath oils. A large basket of succulent tropical fruits. High-quality bathrobes, soft and luxurious. Complimentary Internet service. A large bouquet of fresh flowers when you embark. A convenient espresso machine with a variety of coffees in your suite. Complimentary private car transfers between airport and ship. * A choice of daily newspapers delivered to your suite. ** Wellness Bag exercise kit containing easy-to-carry workout gear available upon request. ** * This amenity does not apply to upgrades. ** This applies to Odyssey, Sojourn and Quest guests only. The configuration of Accessible Suites may vary from the non-accessible suite shown above . Owner’s Suites feature full length window and glass door to private veranda, dining for four, separate bedroom, guest bath, two flat-screen TVs, pantry with wet bar, convertible sofa for one and whirlpool bath. Complimentary internet/Wi-Fi service. Approximately between 576 & 609 sq. ft. of inside space, plus one veranda of 142 & 900 sq. ft. Includes all the in-suite amenities, plus: An invitation from the Master for a bridge visit when the ship is in port. A personal visit from the Hotel Director. Fresh orchids or potpourri in your bathroom. All-natural Molton Brown bath and beauty products including Pure Pampering bath oils. A large basket of succulent tropical fruits. High-quality bathrobes, soft and luxurious. Complimentary Internet service. A large bouquet of fresh flowers when you embark. A convenient espresso machine with a variety of coffees in your suite. 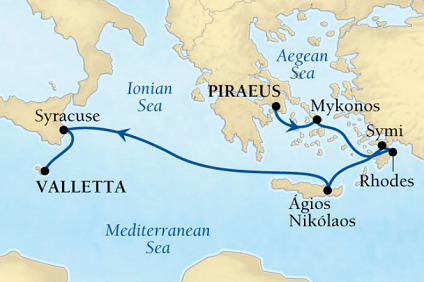 Complimentary private car transfers between airport and ship. * A choice of daily newspapers delivered to your suite. ** Wellness Bag exercise kit containing easy-to-carry workout gear available upon request. ** * This amenity does not apply to upgrades. ** This applies to Odyssey, Sojourn and Quest guests only. The configuration of Accessible Suites may vary from the non-accessible suite shown above. All Penthouse Spa Suites feature dining table for two to four and separate bedroom. Glass door to veranda, two flat-screen TVs, fully stocked bar, spacious bathroom with tub, shower and large vanity. Approximately 639 to 677 sq. ft. of inside space, plus one veranda of 167 to 200 sq. ft. (16 to 19 sq.m.) Includes all the in-suite amenities: Complimentary full-day access to The Spa at Seabourn serene area In-suite spa amenities Spa concierge service Spacious bath with full tub and shower Complimentary in-suite bar stocked with your preferences Second in-suite bar stocked with waters, juices, and healthy snacks 24-hour complimentary room service Fine cotton linens, plush robes and slippers Writing desk with personalized stationary All-natural Molton Brown, London bath and beauty products, including Pure Pampering bath oils Additional Molton Brown, London specialty spa products and a menu of luxurious bath sponges Calming L’Occitane fragrance can be diffused in the suite, and a soothing music soundtrack is available on request Soaps by Hermès, L’Occitane, Baudelaire and Salvatore Ferragamo iPod® docking stations Flat-screen TVs with music and movies The option of in-suite dining served course by course Wi-Fi and cell phone access PressReader mobile – Enjoy your favorite newspapers and magazines from your smartphone or tablet The configuration of Accessible Suites may vary from the non-accessible suite shown above. All Penthouse Suites feature dining table for two to four and separate bedroom. Glass door to veranda, two flat-screen TVs, fully stocked bar, spacious bathroom with tub, shower and large vanity. Approximately 450 sq. ft. of inside space, plus one veranda of 98 sq. ft. (9 sq.m.) In-suite amenities include: Fine Egyptian cotton linens, fluffy duvet, down or hypoallergenic pillows, robes and slippers 24-hour complimentary room service In-suite bar stocked according to your preferences Fine soaps such as L’Occitane and exclusive Therapies bath products by Molton Brown, London Personalized stationery Flat-screen TV with music and movies Wi-Fi and cell phone access The configuration of Accessible Suite may vary from the non-accessible suite shown above. All Veranda Suites feature a full-length window and glass door to private veranda, comfortable living area, queen-size bed or two twin beds, dining table for two, walk-in closet, interactive flat-screen television with music and movies, fully stocked bar and refrigerator, makeup vanity, spacious bathroom with separate tub and shower. Approximately 300 sq. ft. (28 sq.m.) of inside space, plus one veranda of 65 sq. ft. (6 sq.m.) In-Suite amenities include: Fine Egyptian cotton linens, fluffy duvet, down or hypoallergenic pillows, robes and slippers 24-hour complimentary room service In-suite bar stocked according to your preferences Fine soaps such as L’Occitane and exclusive Therapies bath products by Molton Brown, London Personalized stationery Flat-screen TV with music and movies Wi-Fi and cell phone access The configuration of Accessible Suites may vary from the non-accessible suite shown above.